Hey, why didn't I think of this? 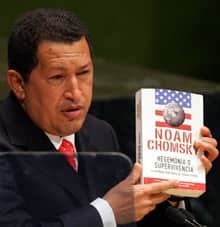 In his speech at the United Nations the other day, the one where he called Bush a devil and said he could still smell the sulphur, Hugo Chavez held up a book by Noam Chomsky called Hegemony or Survival: America's Quest for Global Dominance. He said "The people of the United States should read this ... instead of … watching Superman movies." Chomsky's not exactly light reading, it's not exactly Mad Magazine, if you know what I mean, but right now, if you look at Amazon.com, you'll see that this book is Number One. My book is currently two-hundred-thousand-four-hundred-third. You have a book? please let me know what it is. I would read a book of yours. Click on this linke: amazon.com and scroll down to the 200,403rd book. Actually, it's worse than that. I just checked again and it's 229,057th. Dropping like a rock, it is. Here, to make it easier, just go to Amazon and enter "James Kennedy" into the search bar. There I am. You should try fiction. You seem to have a skill for it. Now we have a tax-exempt organization serving as a marketing tool for its President's books. Hey, buy it used for $59.99. It should be noted that Jim's namesake and ideological buddy down at Coral Ridge Presbyterian sells a lot more books. Jim, write a book about family values and you could probably make some money from the name confusion. You can say whatever you want in the book just give it a confusing title. You're even both Ph.D.s. You're probably right, Jim. If we buy the book will you autograph it? Cool psychedelic cover, BTW. I would love to know how many copies of Chomsky's book sold that day to make it jump so high- and who bought it. I mean are they people who never heard of Chomsky(whose parents- of blessed memory- were my teachers in religious school)before Chavez spoke? I guess I need to ask the White House since they were anxious to get the library and book buying records of certain people. I just checked again, and it's still Number One. Very interesting phenomenon. That book is going like hotcakes. Now, after Clinton's interview on Fox, I wonder how Richard Clarke's book will do.